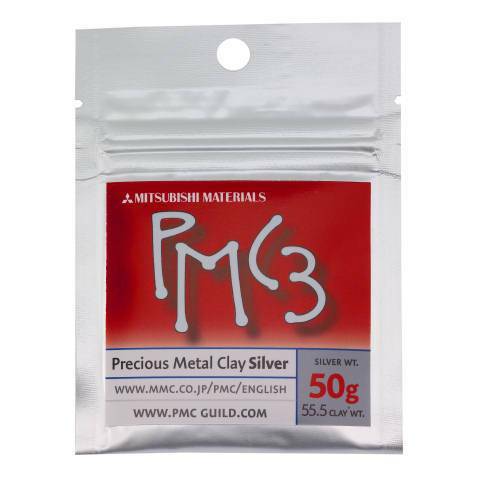 When fired at 1,650° for two hours, PMC3™ is the strongest fine silver metal clay available. It has a finer, smoother composition that’s easy to work with and manipulate. You can also embed findings with confidence--firing at a low temperature means they won’t be heat-damaged. PMC3 is suitable for torch-firing as well as kiln-firing. Priced per individual package; each individual package contains 50g of metal. 1,650°F (900°C) for two hours to achieve highest hardness and maximum durability. 1,290°F (700°C) for 10 minutes. PMC3 fires at the lowest temperature (1290 F) which not only allows firing glass or perhaps sterling, but means alternative low firing devices such as stovetop or torch become available. Use PMC3 when you NEED to fire at low temps.